Your perception of a writing instrument will change when I introduce you to Swiss Army Spectrum Series Ballpoint pens. Each pen features original multi-tools including a knife, scissors, file, screwdriver, and power light. The ball pens are available in perky colors and design and has light activation feature, which gets activated when Swiss cross is pressed. 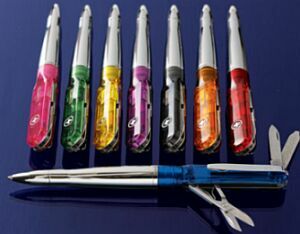 The pens are made of surgical stainless steel with plastic and also have pressurized ink cartridge and twist-action mechanism. The multi-functional pen will come handy in a number of situations throughout the day. The attractive ball pens are available for $50 at Neiman Marcus.